We’d love your help. Let us know what’s wrong with this preview of Home to Stay by Kate James. Fourth book in the San Diego K-9 Unit Series. A missing little boy triggers San Diego K-9 officer Shannon Clemens and her canine search-and-rescue partner into instant action. For the rookie cop haunted by a childhood tragedy, bringing Sawyer Evans's son safely home is more than a job. It's a mission she can't fail… But forging a friendship wi Fourth book in the San Diego K-9 Unit Series. To ask other readers questions about Home to Stay, please sign up. I love this San Diego K-9 Unit series. The bonds that each officer has with their dog is so endearing and I can't help but to love these furry critters as well. In HOME TO STAY, Shannon and her four-legged partner, Darwin, are called to find a missing boy, but the situation hits too close to home for her. Sawyer is a single parent since his wife disappeared a few years earlier and I had a few issues with this. He is ready to move on with life and I didn't like the fact that he made that jump so I love this San Diego K-9 Unit series. The bonds that each officer has with their dog is so endearing and I can't help but to love these furry critters as well. In HOME TO STAY, Shannon and her four-legged partner, Darwin, are called to find a missing boy, but the situation hits too close to home for her. Sawyer is a single parent since his wife disappeared a few years earlier and I had a few issues with this. He is ready to move on with life and I didn't like the fact that he made that jump so quickly and in the midst of a crisis with his son. I guess when love hits, it hits, but I felt like it made him seem a little selfish at times. And I'm not a big fan of a yo-yo relationship. However, I loved seeing characters from previous books show up and to catch up on their lives. Just like in the earlier books of the series, the action and suspense happens right from the beginning and it doesn't ease up until it's all over. It was almost over-the-top, crazy drama--the kind that you wonder if it ever happens in real life. There's a mystery angle that really kept me reading because I couldn't figure out the who-done-it and what the motive was. I devoured the story and came away feeling a little emotionally exhausted and heart wrenched, yet satisfied with how the events finalized. Content: mild language; mild romance; mild violence. In Home to Stay, we start out with high drama, the air thick with suspense, as Shannon and her search-and-rescue Darwin search for a missing little boy, Dylan. From discouragement to hope to elation and everything in between, readers get a front row seat for the search. And let me just warn you – when you think you can relax…. don’t be too hasty! James tossed one curveball after another into the plot and kept tension high. The other sort of tension going on in Home to Stay is the romantical kind. The way their relationship starts is a bit unconventional, and I don’t know that I was comfortable with the timing or the ‘instalove’ aspect of it. BUT, there is no denying their chemistry. (Just wait for that first kiss!!!!) There’s also no denying that they’re good for each other. However, a couple of major obstacles stand in the way of their happily-ever-after – and I truly (almost) didn’t know how everything would play out. The twists and turns kept me captivated, refusing to set me free until I reached the last page! Bottom Line: Suspense, action, romance, DOGS – Home to Stay has something for everyone. The theme of rescue – adopting rescue dogs, the search-and-rescue-team, the way Sawyer and Dylan really rescued Shannon from life- was subtly woven throughout the fabric of the story. This well-crafted novel brims with personality and warmth, and readers will fall in love with the masterfully-trained canines! Kate James is one of my favorite Harlequin Heartwarming authors and I love her K-9 Unit series. The dogs in these books are such a fantastic addition to the stories. This is the fourth book in the series but it can stand alone. In this book, Shannon is a new K-9 unit handler. She and her dog specialize in search and rescue and she gets called in to find a missing boy who had been camping with his father. Shannon lost her brother in almost the exact same way years before which is why she chose th Kate James is one of my favorite Harlequin Heartwarming authors and I love her K-9 Unit series. The dogs in these books are such a fantastic addition to the stories. This is the fourth book in the series but it can stand alone. In this book, Shannon is a new K-9 unit handler. She and her dog specialize in search and rescue and she gets called in to find a missing boy who had been camping with his father. Shannon lost her brother in almost the exact same way years before which is why she chose this profession. Shannon desperately wants to find Sawyer's son and the two form a bond pretty quickly. I really liked Shannon. She was tough but still feminine and tenderhearted. Sawyer was maybe not my favorite guy, I was a bit bothered by his back and forth commitment to Shannon but there was no denying his love and devotion to his son. The mystery kept me interested and wondering all the way through the book. There were twists I didn't see coming and that always makes a book more fun. Sawyer loves his son Dylan very much. When they're on a camping trip Dylan disappears from their tent and Sawyer starts looking for him, but he can't find Dylan anywhere in the woods. Shannon is a San Diego K-9 Unit officer and she brings her dog to track Dylan down. However, Dylan doesn't seem to be there, where did he go? For Shannon finding Dylan is more than just a job and she's determined to bring him back whatever it takes. While doing everything she can to find the little boy she spends qu Sawyer loves his son Dylan very much. When they're on a camping trip Dylan disappears from their tent and Sawyer starts looking for him, but he can't find Dylan anywhere in the woods. Shannon is a San Diego K-9 Unit officer and she brings her dog to track Dylan down. However, Dylan doesn't seem to be there, where did he go? For Shannon finding Dylan is more than just a job and she's determined to bring him back whatever it takes. While doing everything she can to find the little boy she spends quite a bit of time with his father. However, falling in love with the father of a missing child is extremely complicated and the timing couldn't be worse. Will Shannon find Dylan and is there a chance for her and Sawyer or is there too much going on for them to become close? Home to Stay is a gripping and romantic story. Dylan's disappearance kept me on the edge of my seat. He's a sweet little boy and I couldn't turn the pages fast enough to find out why he disappeared. Sawyer is a wonderful dad. He's a kind and caring man and he does everything in his power to make his son happy. I loved that about his character. Shannon is strong, capable and incredibly compassionate. I loved her big heart and the sympathetic and friendly way she treats people is amazing. Home to Stay has the most fantastic main characters and I loved them all from the start. Awakening to find your child missing is every parents nightmare! Sawyer Evans jumps into action searching everywhere to find him, but his efforts are fruitless. He just seems to have vanished! This mysterious, heart-wrenching story is a perfect addition to the SanDiego K-9 Unit series! The story opens with Sawyer Evans discovering that his young son has gone missing from their tent and you are hooked and just have to find out what happened to little Dylan Evans. Enter the just-off-probation K-9 officer, Shannon Clemens and her four-legged partner, Darwin to search for Dylan. What follows is not a smooth-sailing search for Dylan or an easy romance for Shannon and Sawyer. The search for D This mysterious, heart-wrenching story is a perfect addition to the SanDiego K-9 Unit series! The search for Dylan and his kidnapper has many twists and turns and the outcome is very unexpected. At one point, you begin to think all is good and the mystery is solved, but just wait! Shannon has a heart-breaking history and this kidnapping hits too close to home. And Sawyer has a troubled past, too, that complicates their budding romance, To say that their path to romance is bumpy is an understatement. They’re falling for each other but there’s so much getting in their way. From page one, Kate James grabs the attention of hear readers and hooks them with the intense and suspenseful situation in her novel Home to Stay, book four in the Sand Diego K-9 Unit Series. This novel will have readers on the edge of their seats in anticipation of finding out what happens next. This story will not only tug at your heartstrings, but is full of twists and turns that will keep readers coming back for more. Along with the mystery there is also a bit of romance that readers will en From page one, Kate James grabs the attention of hear readers and hooks them with the intense and suspenseful situation in her novel Home to Stay, book four in the Sand Diego K-9 Unit Series. This novel will have readers on the edge of their seats in anticipation of finding out what happens next. This story will not only tug at your heartstrings, but is full of twists and turns that will keep readers coming back for more. Along with the mystery there is also a bit of romance that readers will enjoy. This is an excellent addition to the K-9 series and is one readers will not want to miss! Home to Stay was excellent - fast-paced and suspenseful. I was hooked from the first page. In fact, not intending to, I read it in one afternoon/evening. Couldn't wait to see how it played out. Kate James has a way of making the reader vested in the outcome of the situation, both for the situation itself and for the characters involved. I look forward to each new offering she gives us, the readers. From page one, I was hooked. I’ve thoroughly enjoyed the K-9 series, but Kate James has hit it out of the park with Home to Stay. For Sawyer Evans, his worst nightmare has come true when he awakes, during a camping trip, to find his young son has gone missing. The frantic search for Dylan will keep you turning the pages from the start of this masterfully crafted story that can only be told by James. Rookie K-9 officer Shannon Clemens had me rooting for her from the start. She’s determined to find From page one, I was hooked. I’ve thoroughly enjoyed the K-9 series, but Kate James has hit it out of the park with Home to Stay. 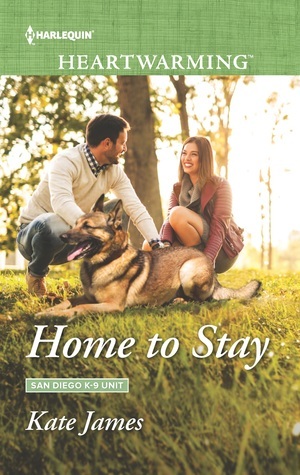 Home to Stay is San Diego K-9 Unit Book 4. Sawyer Evans's four-year-old son, Dylan, was kidnapped from their campsite while vacationing with family. San Diego K-9 unit officer, Shannon Clemens, is called upon with her search and rescue dog, Darwin, to try to locate the missing child. The initial search is unsuccessful and Sawyer is livid. Shannon's emotions are stirred by Sawyer's deep agony over his son's disappearance, and because of her own prior personal experience with loss, she feels compe Home to Stay is San Diego K-9 Unit Book 4. Sawyer Evans's four-year-old son, Dylan, was kidnapped from their campsite while vacationing with family. San Diego K-9 unit officer, Shannon Clemens, is called upon with her search and rescue dog, Darwin, to try to locate the missing child. The initial search is unsuccessful and Sawyer is livid. Shannon's emotions are stirred by Sawyer's deep agony over his son's disappearance, and because of her own prior personal experience with loss, she feels compelled to help Sawyer find Dylan. In time, the distraught father and caring, compassionate officer develop feelings for one another. But when another incident causes tension between the couple, their connection is strained. Will the feelings they've developed be enough to overcome the obstacles they're currently facing? Home to Stay was thoroughly engrossing from the start. As new developments in the abduction case surfaced, the suspense and intensity continued to build, keeping me interested and engaged in the story. The intriguing mystery surrounding Dylan's disappearance propelled the plot forward. I was put in the mind of a romantic suspense novel—albeit a milder approach to the romance and suspense elements, making it suitable for a wholesome romance book. The relationship and dialog between Sawyer and his son was endearing, so sweet and pleasant to read. Dylan was a darling little boy, and I looked forward to scenes where he was present. The relationship between Sawyer and Shannon was at times complex because of surrounding circumstances and I kept trying to envision how things would turn out for the two of them. Riveting and imaginative, I enjoyed this book immensely. An intriguing mystery, suspense, police procedurals, a strained romance and HEA, are some of what you'll get in Home to Stay. Very highly recommended. Who would expect to wake up early in the morning during a camping trip to find that his or her son has vanished? Certainly not Sawyer Evans. The all-encompassing grief he feels as he frantically searches for Dylan conveys to the reader how much he cares for his son, and when it's discovered that Dylan was kidnapped, suspicion immediately falls on felons Sawyer had put away years earlier as a District Attorney. It's a double tragedy for Sawyer, since he lost his wife, Jeannette, three years earli Who would expect to wake up early in the morning during a camping trip to find that his or her son has vanished? Certainly not Sawyer Evans. The all-encompassing grief he feels as he frantically searches for Dylan conveys to the reader how much he cares for his son, and when it's discovered that Dylan was kidnapped, suspicion immediately falls on felons Sawyer had put away years earlier as a District Attorney. It's a double tragedy for Sawyer, since he lost his wife, Jeannette, three years earlier after she disappeared without a trace, and the question arises: Could there be a connection? Rookie cop, Shannon Clemons, is determined to find Dylan, even while dealing with her own haunting experience concerning a lost child, but what she doesn't expect is her feelings for Sawyer. Is it simply because she understands his grief, or is it something more? Several scenarios seem possible concerning the plights of Dylan and Jeannette, and but Shannon keeps striving for the truth. Kate James is a master of intrigue, and Home to Stay will keep you on the edge of your seat as she brings to light the agony of kidnappings and steps that can be taken to solve these crimes. Revealing much knowledge concerning the police department and canine search-and-rescue, she skillfully weaves it into her complex plot. For a romantic mystery that's difficult to put down, pick up a copy of Kate James's Home to Stay. This book had a lot going on emotionally, so brace yourself for a roller coaster ride of emotions! Love, respect, fear, suspense, worry, excitement, happiness, sorrow, and surprise. And don't forget there are dogs involved!! Nothing makes a book wonderful like a dog character does, for this animal lover anyways. This was a fast paced storyline, so make sure you are taking in every single world or else you might miss something. I liked Shannon's character most of all. She had a heart of gold, and This book had a lot going on emotionally, so brace yourself for a roller coaster ride of emotions! Love, respect, fear, suspense, worry, excitement, happiness, sorrow, and surprise. And don't forget there are dogs involved!! Nothing makes a book wonderful like a dog character does, for this animal lover anyways. This was a fast paced storyline, so make sure you are taking in every single world or else you might miss something. I liked Shannon's character most of all. She had a heart of gold, and was dedicated to her job. But most of all, she was compassionate and not clingy. I do not like it when the main female character is clingy to the person they have feelings for. It ruins the story for me. But here, Shannon was her own person, and was more than willing to give Sawyer the time and space he needed throughout the book to figure things out on his own. Due to the circumstance surrounding their "feelings" for each other, this was extremely important. These characters needed to make sure they were actually feeling something for each other, and not just full of emotion during the crisis of Sawyer's missing son. The brilliance that is Kate James’s latest novel—Home to Stay—with Harlequin Heartwarming will tug at your heartstrings with the emotional intensity layered throughout the story. I was glued to this book the moment I scrolled to chapter one. The conflict is set in motion when Sawyer wakes up to find his son, Dylan missing. Taut writing sets the scene going, as a whirlwind of emotions entangle you with the plot. The adrenaline rush had him gasping for air. The sleeping bag was empty. From that moment onward, stellar writing had me hooked. The search for Dylan brings Shannon, a San Diego K-9 Unit officer and her dog into Sawyer’s life and over the course of the book feelings go awry for everyone. But it is the lingering awareness between Shannon and Sawyer that catapults things to whole new level. Where could Dylan be? And does Shannon stand a chance with the single dad? Kate James is a wonderful writer. I enjoy reading how she builds her characters. I wish there was more romance in the story, but this story is one that grips you from the first page. As a parent, losing a child is your worse night mare. Kate handles the story with authenticity and compassion. Lead male character Sawyer Evan's has lost a lot, first his wife and now his son. I can only imagine the pain these two incidents would have on a person. Kate James communicates these tragedies with sincere Kate James is a wonderful writer. I enjoy reading how she builds her characters. I wish there was more romance in the story, but this story is one that grips you from the first page. As a parent, losing a child is your worse night mare. Kate handles the story with authenticity and compassion. Lead male character Sawyer Evan's has lost a lot, first his wife and now his son. I can only imagine the pain these two incidents would have on a person. Kate James communicates these tragedies with sincere understanding. Officer Shannon truly has a dilemma, attracted to Sawyer she doesn't know how to tackle her feelings of affection and guilt. I love the story component of officer Shannon working with her dog and locating the young boy. She doesn't know if or how she should consider a relationship with Sawyer. Fortunately, she is critical in the rescue of Sawyer's son and helps put to rest the disappearance of his wife. This book really pulled at your heart strings. As a Heartwarming book I wasn't really expecting a bit of suspense. It is # in the San Diego K-9 Unit and was a first of the series for me. The love that Sawyer felt for Dylan was only natural for your father and son but the love that Shannon had for Dylan was because he was part of the man she was falling in love with. Through out this book we are on a journey to figure who abducted Dylan as well as trying to figure out why. This book had a lot of This book really pulled at your heart strings. As a Heartwarming book I wasn't really expecting a bit of suspense. It is # in the San Diego K-9 Unit and was a first of the series for me. The love that Sawyer felt for Dylan was only natural for your father and son but the love that Shannon had for Dylan was because he was part of the man she was falling in love with. Through out this book we are on a journey to figure who abducted Dylan as well as trying to figure out why. Fourth in the San Diego K-9 series, the story focues on Shannon Clemens, a rookie search-and-rescue officer, her canine partner, Darwin, and the father of a lost child, said child later identified as having been kidnapped. But why? Sawyer Evans is no longer an ADA; he's now working as a law professor at a local college, a position he took after his wife and the mother of Dylan, disappeared. He thinks she's dead, but no one knows for sure. When Dylan is found, Sawyer finds himself drawn to Shannon. Fourth in the San Diego K-9 series, the story focues on Shannon Clemens, a rookie search-and-rescue officer, her canine partner, Darwin, and the father of a lost child, said child later identified as having been kidnapped. When Dylan is found, Sawyer finds himself drawn to Shannon. She knows what it's like to lose a child. Her kid brother suffered a similar tragic fate years earlier. So the book starts with Sawyer's son Dylan going missing and Shannon is a member of the K-9 unit ad she is assigned to find Dylan. There is also some mystery regarding Sawyer's wife who has been missing for a few years. Sawyer's life is very complicated throughout the book, which leads to confusion in his relationship with Shannon, but all's well that ends well. It starts with every parent's nightmare...waking up to find your child is missing. Dylan the kid and the dogs are super. Sawyer and Shannon are well drawn but Dylan steals the show. The extreme ups and downs in this story made it a harder read in my opinion than the others in the series. If you read just for an upbeat escape, this is not my first choice. When rookie K-9 officer Shannon Clemmons is called out on a search that hits close to home, her investment in the case becomes personal. Not only because she wants to prove herself in her position but also because the circumstances surrounding the case remind her of her own loss of a loved one. One that did not have a happy ending. In attempt to support Sawyer Evans as the search for his son continues, Shannon offers him support. As she spends time with Sawyer, she must walk the line between prof When rookie K-9 officer Shannon Clemmons is called out on a search that hits close to home, her investment in the case becomes personal. Not only because she wants to prove herself in her position but also because the circumstances surrounding the case remind her of her own loss of a loved one. One that did not have a happy ending. In attempt to support Sawyer Evans as the search for his son continues, Shannon offers him support. As she spends time with Sawyer, she must walk the line between professionalism and friendship (and perhaps more than friendship). The connection between Shannon and Sawyer is strong from the beginning, add in an adorable boy and a couple of dogs and this one left me smiling more than once. It also left me guessing. Kate James threw a few red herrings in the mix. Someone would show up and I’d think, “They’re the one!” but nope, move on to the next suspect. A sweet and enjoyable read with a strong story line filled with moments of tension and others of heart. While this is part of a series, it is easy to follow on it’s own. But if you’re anything like me and get invested in characters, you’ll probably want to go back and read the other books in the K-9 series. I know they’re now on my TBR list! I receive complimentary books for review from publishers, publicists, and/or authors, including NetGalley. I am not required to write positive reviews. The opinions I have expressed are my own. I am disclosing this in accordance with the Federal Trade Commission’s 16 CFR, Part 255.
himself. How could this happen? Shannon Clemens and her partner Darwin are on the scene. They know he's been abducted. What they don't know is by whom. going on. So much more added as well. See what happens buy the book. I’ve read all of the books in this series except for the first. I’ve loved them all, and this one is no exception! Books involving animals are always so heartwarming. I really enjoy the K-9 series because of the special bond an officer has with his or her dog. In this case, Shannon Clemens is a search-and-rescue officer, and she gets called into a case for a missing little boy. Shannon is ready for action, but the case hits close to home. She lost someone close to her when she was younger, and that gives her a sense of desperation to find this boy before it is too late. The officers from previous books show up, but you don’t need to read them first. They help Shannon work through her emotions concerning the missing child’s father. I love how compassionate the characters in the book are. They’re far from perfect, but they always are thinking of what others are going through.